Spektakulärer Blick auf die Berge! Schön ernannt. Pool. Wanderwege. Deck. Luxury Carriage House Studio. Queensize-Bett. Voll ausgestattete Küche. Bath. Schlafmöglichkeiten für 2. Erleben Sie einen wunderschönen Blue Ridge Mountain Urlaub auf einem privaten Bauernhof! 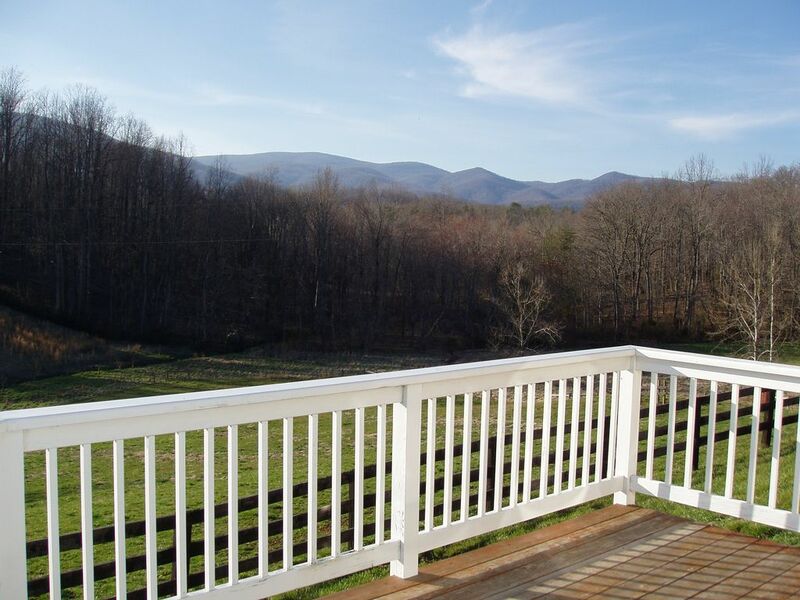 Genießen Sie die kühnen Ausblicke auf die Blue Ridge Mountains während Sie auf Ihrer privaten Terrasse im Carriage House auf Fairhill Farm, einem bewirtschafteten Bauernhof von 142 Hektar, faulenzen. Schlendern Sie auf dem Bauernhof oder wandern Sie auf unseren privaten Wegen. Fisch im privaten Teich oder im Fluss. Genießen Sie den Pool. Erfreuen Sie sich an Bauernhoftieren einschließlich unserer Miniaturpferde. Das Hotel liegt 2 Stunden südwestlich von Washington, DC, 1 1/2 Stunden östlich von Richmond, VA und 25 Minuten nördlich von Charlottesville, VA.
Fünfzehn Minuten vom Shenandoah National Park, dem Skyline Drive, dem Appalachian Trail entfernt. Monticello, Montpelier, Ash Lawn und die Universität von Virginia und viele weitere historische Sehenswürdigkeiten sind nur eine kurze Autofahrt entfernt - Luray Caverns, historische Williamsburg, Leesburg, Natural Bridge. Das Carriage House ist herzlich mit einem Mahagonibett, einem Ledersofa und weinroten Akzenten ausgestattet und eignet sich perfekt für einen komfortablen und gemütlichen romantischen Rückzugsort, ein Jubiläum, einen Wochenendausflug oder einen wundervollen längeren Urlaub. voll ausgestattete Kombüse Küche w / benutzerdefinierte Schränke. Bügeleisen und Bügelbrett; Zugang zu Wäsche. Zentral in Virginia in der Nähe von: Historische Stätten wie Monticello, Montpelier und Ash Lawn; Universität von Virginia; Charlottesvilles Fußgängerzone; Der Shenandoah Nationalpark, Appalachian Trial und Skyline Drive; viele Weingüter und vieles, vieles mehr! Ein Tagesausflug nach Washington, DC; oder Williamsburg, VA.
Privat auf 142 Hektar großen Farm mit Pool, private Teiche, Wanderwege, Minipferde und Mehr! Zugang zu unserem angrenzenden Hoch Fields Farm von 130 Hektar. Beide Farmen umgeben von über 2000 Hektar geschützter. Bitte lesen Sie die "Was unsere Gäste sagen:" Seite auf unserer Website! The Carriage House is a fantastic place. Very warm and cozy even on the cold winter days we stayed. We were looking for privacy and seclusion and got it in every way. Alton was a wonderful host even though we never met face to face. We enjoyed the hiking trails, too. The only negative is the bed: extremely firm and made our first night especially restless, and is probably enough to keep us from returning. However, the peace and scenery made up for it and we had a lovely weekend. Thanks, Carl. For your review and feedback. All our mattresses are the same brand as the Four Seasons resort. They are firm but the vast majority of our guests prefer. In our Welcome Book in cottage we do note that a 4 inch memory foam topper is available for those that prefer. We wish that you had let us know so out staff could have accommodated you. Absolutely beautiful property and the studio had everything we needed to be comfortable. The Carriage House was clean and in good repair, everything worked. The unit was filled with natural light and very pleasant to be in. Property lent itself to just taking a breather and relaxing. We lost one day of hiking to some serious rain but we found several nearby art galleries to wander through and passed a few lazy hours putting together a jigsaw puzzle we found in the unit. The puzzle even had all its pieces! Highly recommend, would be happy to stay again. We loved our stay. The carriage house was very clean with amazing views. We loved being able to wake and walk down the road to the cows and mini horses. The view from the pool was incredible. The weather was rainy, but I can only imagine being in the pool on a nice sunny day. The carriage house has a full kitchen and was much more spacious than we thought it would be. Alton was very nice and responsive as well as any farmer we ran into. The farm is 10 minutes from Shenandoah National Park and a lot of great historic places. It was a great experience and really healing to be in a serene environment away from work! We will definitely be back! A great cottage for a couple near Shenandoah! My husband and I took a short trip to Shenandoah National Park for the first time, and the Carriage House Studio was more than what we expected. It was clean and cozy. Alton made sure we were comfortable without being intrusive which we greatly appreciated. We will book the cottage when we come visit the area, again. Beautiful and just what the doctor ordered! We loved the carriage house! Everything was very well designed and appointed to make this cozy space into a super-efficient and relaxing getaway for 2 people! We also loved the very friendly barn kitties and mini ponies! The on-site trails were a major plus as well. We will definitely be returning! Wunderschön gelegen in einem ländlichen Bauernhof-Einstellung mit eigenem Wanderwegen, Schwimmbad, Teich, privaten Flussufer und spektakuläre Blue Ridge Mountain Ansichten über 270 private Hektar ausgestattete Studio. Umgeben von über 2000 Hektar geschützter. In der Nähe von historischen Stätten wie Monticello, Montpelier, Ash Lawn, University of Virginia. Zahlreiche Weingüter in der Nähe. Fünfzehn Minuten von Shenandoah National Park, Skyline Drive und Appalachian Trail. Neunzig Meilen südwestlich von Washington, DC und 25 Meilen nördlich von Charlottesville, VA.
$100-150/Night Rates: Rates vary depending on accommodation and are subject to change without notice. Deposits: An advance deposit of 50% or one nights rental, whichever is greater, is required to guarantee the reservation. The balance is due at departure. Reservations: Payment: Deposit and payment may be made by check, cash or money order only. Make checks payable to Fairhill Farm Cancellations: Cancellations notice must be received at least 14 days prior to schedule arrival for a full refund. Guests canceling less than 14 days prior to stay will receive a refund only if the property can be re-rented. Restrictions: We do not allow smoking or pets in any of our rentals. Check In: 4pm Check Out: 11:00 AM Off-Season: December 1st-March 31st	$500 per week $100 per night (Monday-Thursday) $125 per night (Friday, Saturday and Sunday) In-Season: April1st-November 30th $700 per week $125 per night (Monday-Thursday) $150 per night (Friday, Saturday and Sunday **A two night rental is required for in-season weekends **In-season rates apply for Christmas/New Year's week **Ask about our military discount!